NASA's InSight lander is due to set its first science instrument on Mars in the coming days. But engineers here on Earth already saw it happen - last week. 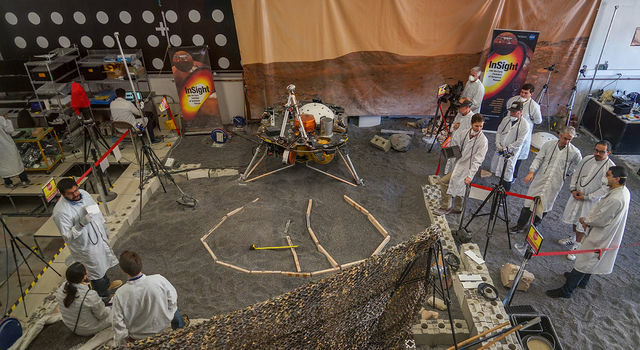 Like NASA's Curiosity rover, InSight has a full-scale working model at the agency's Jet Propulsion Laboratory in Pasadena, California. 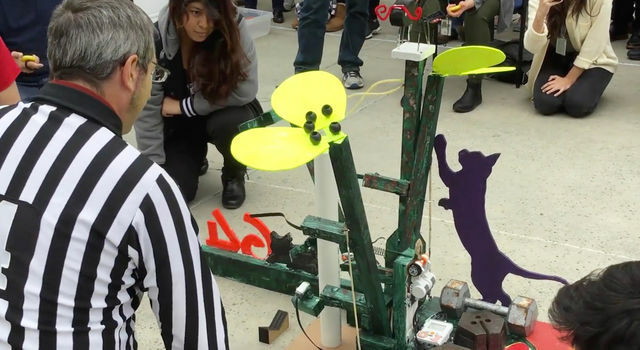 This sister lander, aptly named ForeSight, lets the team test all operations before they happen on Mars. To practice how InSight will place its instruments, JPL engineers built a Martian rock garden modeled on images from the spacecraft's cameras. The team raked, shoveled and patted down a bed of crushed garnet intended to simulate Martian sand. They call the shaping of this gravel-like material "Marsforming." A four-inch (10-centimeter) layer of garnet was added to the lab space in order to match the height and slope of the surface in front of InSight. 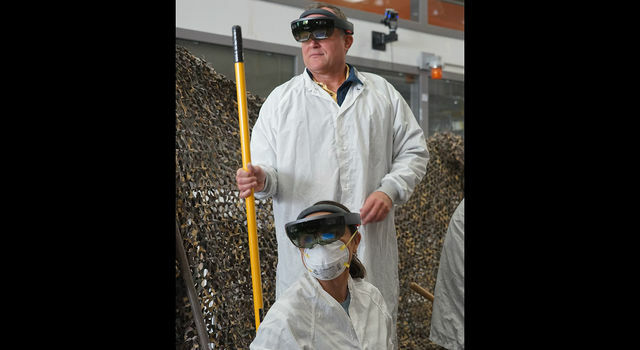 Donning augmented-reality headsets allowed the team to project digital terrain models of the landing site onto the test bed, checking whether they needed to scoop more gravel into the space or smooth it out. 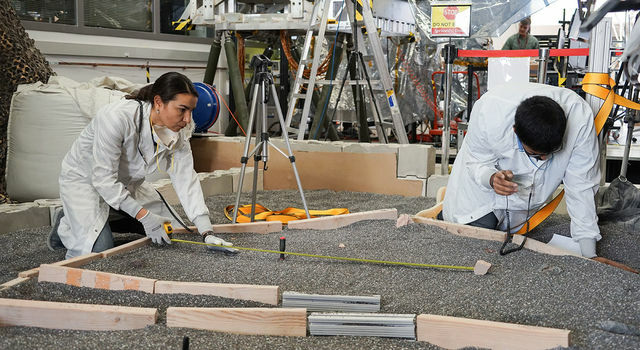 Wood blocks marked the perimeter of the areas where the lander's seismometer and heat flow probe could be placed; precision cameras in the lab were used to measure each feature they intended to replicate. It took about four hours to mimic every detail, down to any pebbles or rocks larger than an inch (2 centimeters). Larger rocks present various challenges, both to the lander and the instruments it will place on the planet's surface. The team has to make sure the electrical-wire-laden tethers that connect the instruments to the spacecraft won't catch on or abrade against a sharp rock. 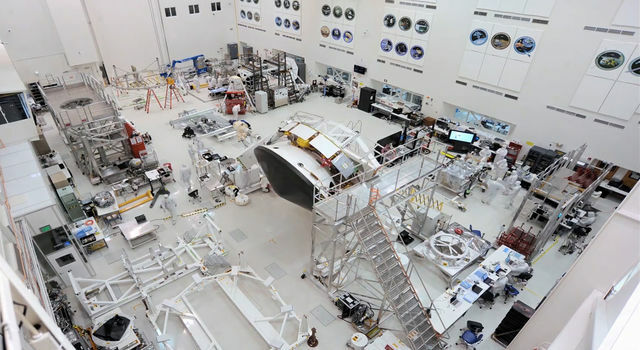 Thankfully, a composite image of the workspace released last week revealed the area was smooth and largely rock-free, making the job easier than expected. "It's great for the science we want to do," said JPL's Marleen Sundgaard, who is guiding the test-bed work. "It's the flat parking lot the landing team promised us. You calculate the probability of rocks in the area and hope the odds are in your favor." The odds have been very much in favor for InSight. 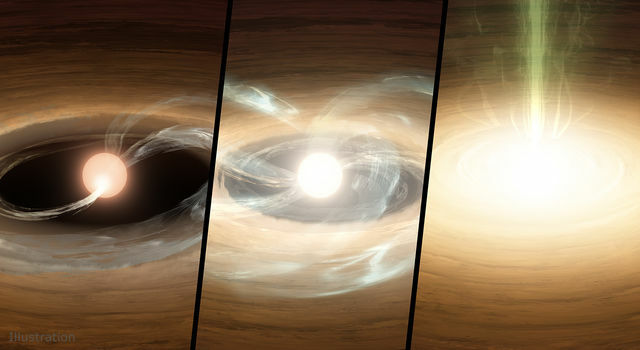 "All around us, there are rocks that were ejected from nearby craters. 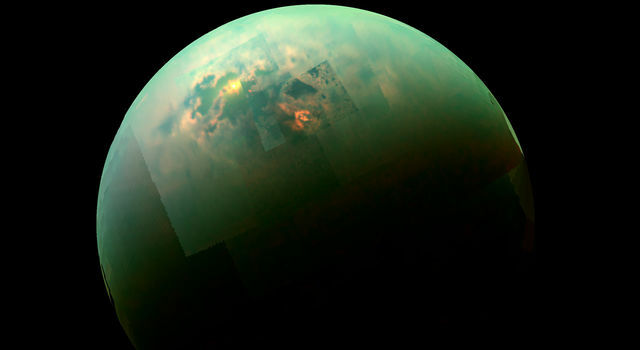 These can be launched miles across the landscape, depending on the impact size," said Nate Williams, a JPL post-doctoral researcher working with the mission. "Thankfully, there just aren't a lot of rocks right in front of us." About 70 feet (21 meters) from the lander lies a field of small boulders that would have made Marsforming harder, Williams said. He lent his geologist's eye to the work, selecting rock samples for the test bed that matched the size, shape and locations of those near InSight. By slipping on Microsoft HoloLens headsets, the team could see a glowing red Martian surface with blue contour lines modeled on the actual terrain in front of InSight on Mars. This was a new use of the HoloLens for JPL, said Parker Abercrombie of Ops Lab, the JPL group that provides this digital modeling. For the last several years, scientists with NASA's Curiosity rover have used the HoloLens in conjunction with custom software called OnSight. It lets them "walk" on Mars and make decisions about what to study next. Every bit of additional realism in the lab creates a more reliable test. The team spent this past weekend commanding each movement of ForeSight's robotic arm, ensuring that the instrument tethers stayed clear of rocks. 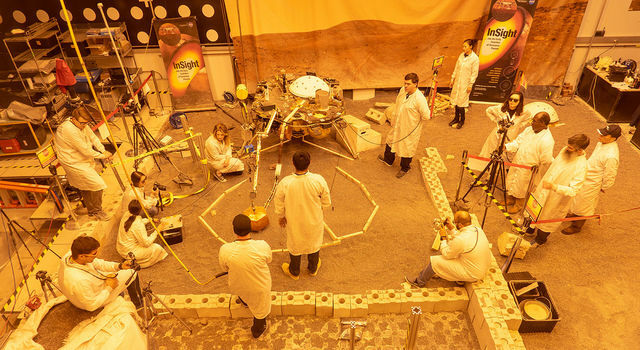 By Monday morning, they had confirmed the science team's preferred placements: about 5.4 feet (1.6 meters) directly in front of the lander for the seismometer. The heat flow probe will be placed roughly the same distance from the lander, but about 4 feet (1.2 meters) to the left of the seismometer. The commands to set down InSight's seismometer are being sent to Mars today. In a few days, Sundgaard and her team will be waiting to see the first pictures of their work recreated robotically on the Red Planet. A number of European partners, including France's Centre National d'Études Spatiales (CNES) and the German Aerospace Center (DLR), are supporting the InSight mission. CNES and the Institut de Physique du Globe de Paris (IPGP) provided the Seismic Experiment for Interior Structure (SEIS) instrument, with significant contributions from the Max Planck Institute for Solar System Research (MPS) in Germany, the Swiss Institute of Technology (ETH) in Switzerland, Imperial College and Oxford University in the United Kingdom, and JPL. DLR provided the Heat Flow and Physical Properties Package (HP3) instrument, with significant contributions from the Space Research Center (CBK) of the Polish Academy of Sciences and Astronika in Poland. Spain's Centro de Astrobiología (CAB) supplied the wind sensors. She used to struggle in school, but JPL intern Michelle Vo spent the summer "killing it at NASA" while working on VR and AR software for Mars missions.